When’s the last time you took part in an afternoon tea service? Have you thought about offering one in your café? The midday tradition is alive and well in the United Kingdom, complete with ornate desserts and fine china. While this may not easily blend with caffeine habits in US cities, with creativity and intentionality, afternoon tea can have a successful run in any café. In the mid-1840s, Anna Russell, Duchess of Bedford, found herself rather hungry in the time between her light luncheon and supper, which was served late into the evening thanks to the advent of kerosene light. 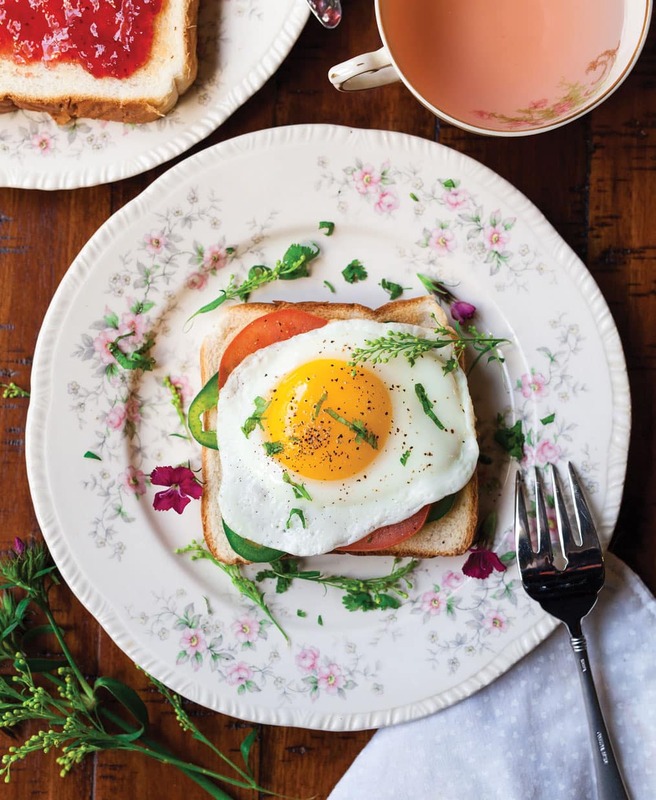 She asked for some sandwiches and tea as a snack in the middle of the day and enjoyed it so much, she began to invite other socialites over to share in the midday treat. Thus, the fashion of taking afternoon tea was born. High tea, low tea, afternoon tea, cream tea, and meat tea are all terms that referred to a meal in which tea was also served. Tradition depended on class. If you were wealthy, it would be traditional to have scones, clotted cream, jam, finger sandwiches, and a selection of sweets with your tea in the middle of the day. Commoners had their tea with meat, bread, and sides as more of a dinner. This commoner version took the name high tea because it was served later in the afternoon, closer to dinner. Low tea, or afternoon tea, was a fancier presentation served earlier in the day. Some say “low” refers to both time of day, and the height of the tables upon which tea was served. Anyone referring to afternoon tea as “high tea” is technically incorrect, and actually referencing “low tea.” However, in recent times these terms have become nearly interchangeable. The tradition has traveled all over the world since Russell first ignited the trend. Afternoon tea as we know it today is a leisurely dining experience, allowing time to relish scrumptious, savory, and sweet goodies and pots of steaming hot tea. In London, abundant options for afternoon tea mean fierce competition, resulting in many inventive presentations. Aiming to delight and surprise with small details, the lengths to which chefs go are outrageous. Guests of a science-themed afternoon tea at London’s Ampersand Hotel can enjoy Saturn-shaped bonbons and chocolate dinosaurs while sipping beverages from beakers. 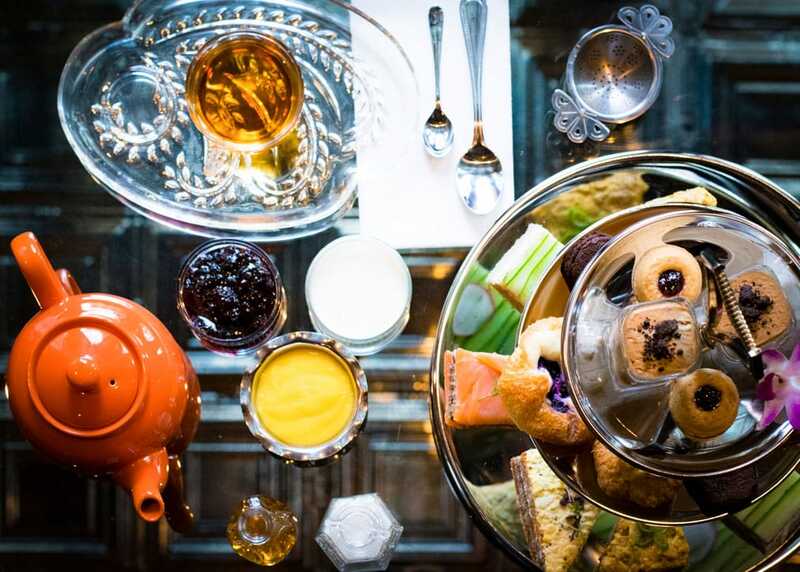 Fashion-inspired creations dominate afternoon tea at London’s Berkeley Hotel; menu items include cookies shaped like high heels, and puddings topped with wild chocolate decorations, like a skirt with a leg sticking up. Diners can also expect ornate details in a London tea presentation. Pastries are little works of art, offering visual delight to accompany rich flavor profiles. London’s Capital Hotel serves treats meticulously topped with details like tiny chocolate snowflakes. Inside the city’s Sketch building, which houses several eateries, afternoon tea condiments are served in miniature ceramic bathtubs and sandwiches are wrapped in paper and tied with satin ribbon. In the United States, afternoon tea has never quite reached the same level of popularity. People taking part in afternoon tea are typically tourists or locals celebrating special occasions. Tea houses in New York, New York, offer beautiful presentations with a robust selection of baked goods. You’ll see more cupcakes, muffins, and eclairs, and slightly larger portion sizes than you would in a British afternoon tea. But afternoon tea isn’t just for tourists or bridal showers. It can be for anyone, on any day. With less competition for business in the States, café owners don’t need to worry about over-the-top presentation. Instead, they can focus their efforts on providing a tea experience focused on intention and quality. Designing an afternoon tea service to fit modern culture is a task we’ve set out to accomplish at Garfunkel’s. We want to make an elegant tea service more accessible, less stuffy, a little sexier, and just as scrumptious as some of our London counterparts. Our tea is served on glass plates, atop mirrored tables on the second floor of a historic building filled with velvet couches. We offer only single-estate Indian tea, which sets us apart from even the London teahouses, and provides a new experience for many customers. We want people to take a digital detox, connect with their companions, and find a bit of an escape in this hectic city. Afternoon tea is all about intention. Offering guests information about teas, adding flourish to plates, and creating a unique environment all make the fashion of taking tea during the day more alluring. Whether it’s providing a cozy setting, cutting-edge cutlery, or exotic teas, it’s important for each café or teahouse to find an angle on tea presentation and carry it through, focusing on each aspect of the experience. How will you create a memorable afternoon tea for your customers? —Amy Dubin is founder of Janam Tea, and host of afternoon tea at Garfunkel’s Speakeasy in New York City.